This is somewhat of a milestone piece as it was begun on the living room table and was completed in the new studio office in Dunstable. So there was somewhat of a break between the under-colour drawing stage and the final detail passes. This time included painting the dark grey office walls white and visiting IKEA for some appropriate furniture; and transporting draws and materials from home. It is hard to say that this upheaval particularly affected the painting; but it was certainly a busy period. Not only did I set up a new studio but I also performed as an Ugly Sister in Toddington too! Oh yes I did: Oh no I didn’t ..etc. So the picture itself was a commission from my Uncle. The initial idea was a local landscape view near them in Derbyshire, but evolved during our weekend stay with them into something involving their dogs. I took countless photos and so did my wife and sister in law. Though Rufus was the star attraction in my mind and the biggest of the three, I became drawn to this image of Bailey. This image is based on two similar photos, subsequently mangled together in photoshop . One of the images had a blurry dog yawning away, with the version of Sue you see here – I liked the half obscured face. The second had the dog poised as seen in the final painting with Sue’s head thrown back which didn’t work so well for me. The aspects that excited me about the compiled image was that it feels like two portraits inhabiting the same canvas. 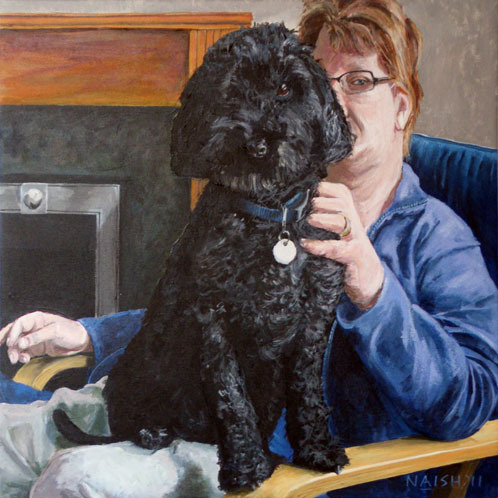 If you deleted the background and left the dog with say a maroon wash behind I think it would work and also if the dog disappeared an interesting portrait of Sue would remain. The other aspect to interest me is that two eyes are looking at you – perhaps slightly unnerving but interesting never the less.